How did Texas cattle get such long horns? Evolutionary biologist, MacArthur Genius grant winner, and cattleman David M. Hillis figured it out. The longhorns are descended from cattle brought by Spanish explorers in the 1500s. These cattle escaped and lived wild in the American Southwest for 300 years. Having to fight off predators, their horns evolved to be longer and longer—measuring as much as seven feet across. Turns out, the longer the horns, the safer the calves. 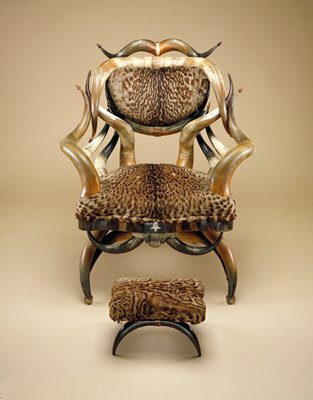 This chair was made in the late 1800s when the longhorns were prized for their meat and hide but the horns were discarded.